photos of your trees from different angles. measurements of the trees – see our layout page. check on building and zoning department requirements. Any requested design, style, and features. We can assist with design, arboricultural and engineering services, or expert witness reports and testimony. Everyone needs a custom level of assistance, so we charge per hour. Our tree house consulting rates are $100-250 per hour depending on what you need done, whether it is a rush request, and which of our staff members is best able to assist you. If you are simply looking for an estimate for your treehouse, we are happy to discuss the process with you and give you ballpark cost range at no charge. If you have a design and/or plans already made, then we will look at them and provide a free estimate. However, if we need to create a custom design for you, then we will ask you to pay for design work in advance. 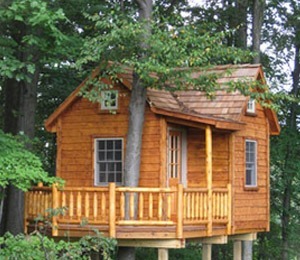 For simple treehouse designs, it usually costs less to purchase a basic treehouse plan without going through the custom design process and incurring hourly rates. For additional tree house consulting options, visit our Site Visits page or Contact Us to make an appointment and begin.